Manhattan has a new movie theater! Regal Cinemas has officially opened a brand new 14-screen multiplex in the Lower East Side. The theater features recliners and dine-in options and is part of “Essex Crossings”, which a large development in the Lower East Side. It’s officially located at 129 Delancey Street and opened on April 6, 2019. This is the first new Regal theater in Manhattan in over 20 years. The cinema chain plans to also open a new location in Staten Island and two new locations in Queens (one in Sunnyside and one in Flushing), which are likely going to open sometime this or next year. The theater has 14 auditoriums, with one of them offering Regal’s premium format RPX. All of them have recliner seats. There is no matinee discount and standard 2D tickets come at $17.90. However, customers may use and collect RCC (Regal Crown Club) points for this theater as they can for any other Regal location. Tickets are also sold on the major online ticketing websites, Fandango and Atom. The first slate of movies which were shown on the theater’s opening day were of Shazam!, Pet Cemetery, Unplanned, Captain Marvel, The Best of Enemies, Dumbo, Us, Five Feet Apart and Wonder Park. The earliest opening day show was Shazam! at 10:30AM and the latest was Us at 12:30AM. The theater is also currently pre-selling tickets for Avengers: Endgame. 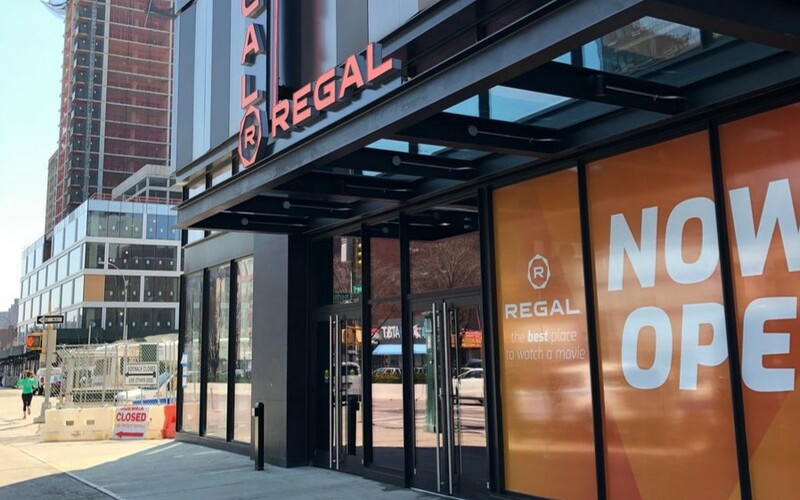 This Regal is now the second new movie theater to open in New York City this year, after a new AMC in Staten Island having opened earlier.